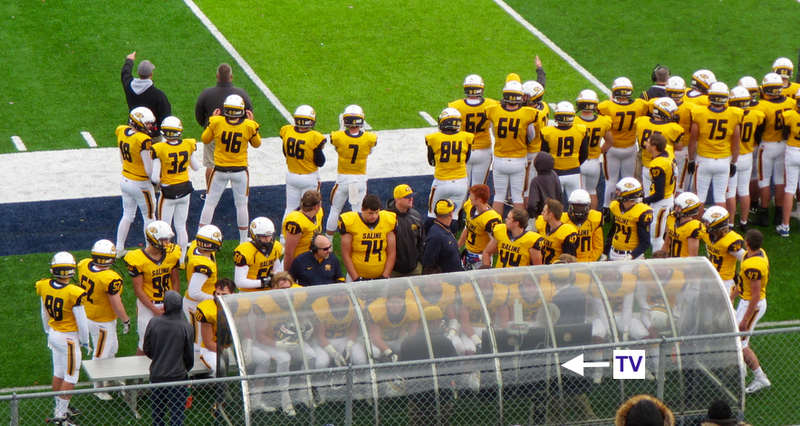 Game Data Live is a software product that manages play info, photos and video of football plays live during a game. Changes in the NFHS rules for high school football allow the use of electronic devices on the side line and in the locker room. 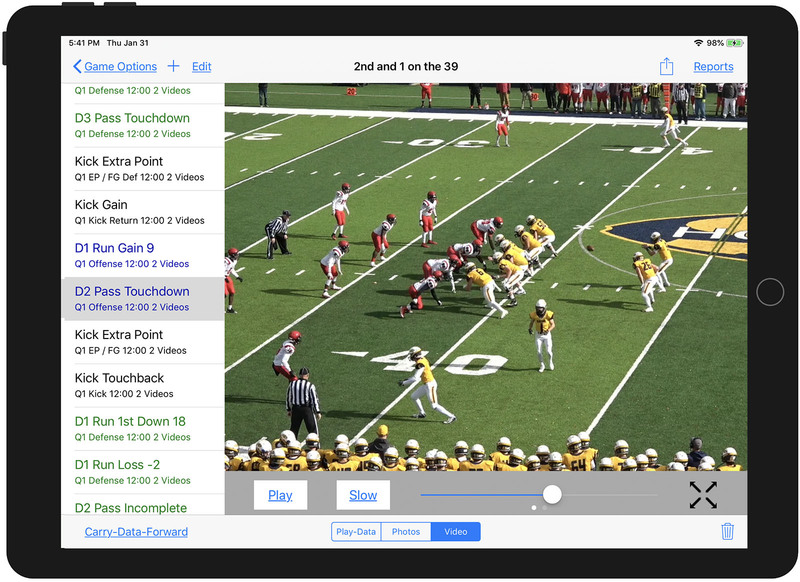 Game Data Live can capture video with an iPad / iPhone's camera or use video from a camcorder. You can use SneakerNet or WiFi to deliver game stats, scouting reports, photos and video to the pressbox, sideline or locker room. With Game Data Live, you can watch football game video identified by play info so you can choose and review significant plays immediately. After the game, you can upload the data to Hudl. Several implementation options are possible. Game Data Live was first created for Apple's iPad. The iPad is portable, has its own camera for photos or video and can be made weather proof. Networking can be wired or wireless. With IOGrapher's iPad cases, you can attach a tripod and a telephoto lens. With Game Data Live, you can watch football game video identified by play data so you can quickly choose and review significant plays. In the example above, the playlist is color coded for Offense, Defense and Special teams so you can find a series of plays in no time. Each play shows down, run or pass, yards gained and results so you can find and review significant plays fast. Game Data Live for iPhone works well as a camera in a Game Data Live Network instead of using an iPad. It has most of the functionality of the iPad version. Your iPhone may have a better camera than your iPad. Game Data Live for the Macintosh takes side line video to the next level. Similar to Game Data Live for iPad, Macintosh users can enter data, capture and view video and view reports. Compared to an iPad, a Macintosh usually has a larger screen, more storage space, a more compact user interface, more ports to connect to and can also be your Game Data Live Network server. You can connect a Mac to wired gigabit ethernet, a video camera with lots more zoom, a TV and electrical power simultaneously. Captured video can be uploaded to the server in the same Mac instantaneously. 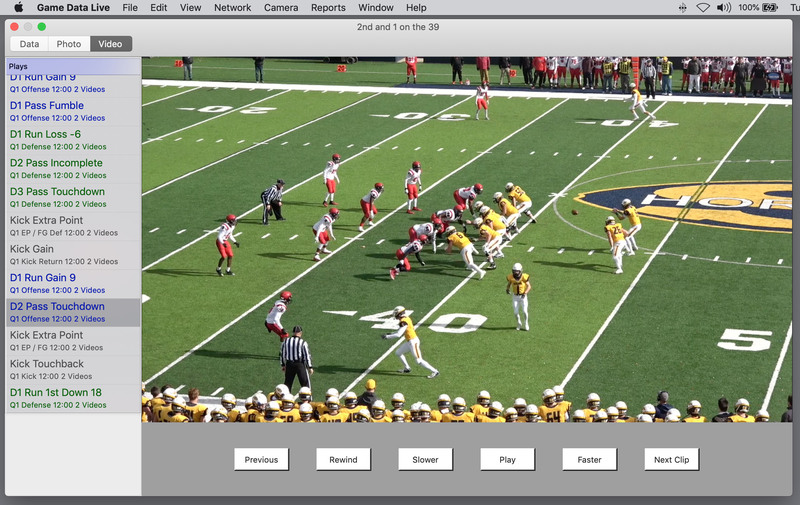 Camcorder video quality is better than an iPad camera - especially from the endzone. Video can be delivered in the pressbox using ethernet cables in about a second or using WiFi too. Game Data Live Network lets multiple iPad / iPhone / Macintosh users team up to get the job done. Play data entry is shared with all users on the Game Data Live network. A Photo or Video can be transferred from one device to another automatically after you finish shooting. Game Data Live networking is device to device using WiFi or wired ethernet. It does not use the internet. You likely will provide your own networking equipment for Game Data Live Network. That equipment would include a router and a directional access point. With Game Data Live you can get video to the sideline with SneakerNet ($49) or WiFi (under $500). You can implement your game time solution at the level of complexity that you're comfortable with. Use the links at the top of this page to learn more. Hardware includes $500 shopping list. Robust - Build It Yourself - networking. No Annual Subscription fees. To try Game Data Live - Visit Apple's App Store from your iPad or Macintosh. The free download has 2 teams, 1 season and 1 game. You can purchase the ability to create your own teams, seasons and games from within Game Data Live.